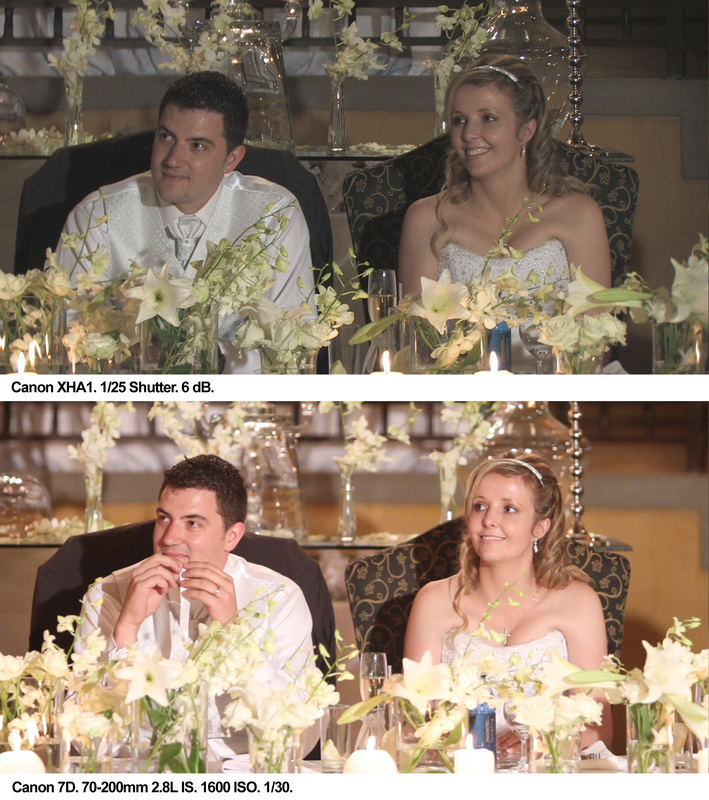 I rented in the 7D over the weekend to shoot along side my Canon XHA1 at a wedding. Here is the results from my low light tests at the reception. In all cases color/noise and brightness looked better on the 7D. My conclusion is that the 7D is definitely a good low light camera for wedding receptions. No color grading or editing was done to the images. But the 7D is also showing a good deal higher contrast level. It is blowing our the whites in the video to expose for the faces. The A1 is showing more much more range to work with. The difference in the flowers between the 2 is staggering. And your not in a high contrast lighting scenario at all. I shoot with the XL H1S and the 7D together, and I limit the 7D shots to closeup shots. Michael I agree with you, however this was my first shoot with the 7D. I've noticed it's very hard to judge exposure and easy to over expose shots without Zebra Stripes to help. I agree with that. But the thing here is your exposure for their faces is within range of where it should be. And the flowers, the guys white shirt, etc. are all blowing out tremendously in a low contrast lighting situation. It shows the limited range the SLR has in relation to the A1. You should try shooting with the Marvel cine setting that you can download from his site. It lowers the contrast a lot in the 7D. Still not at the level you can get out of the XH/XL but it helps. B) Could a 35mm adapter address the same light issues that the 7D doesn't have? I realize you can't manipulate the ISO setting in the XH A1, but it would be nice to know if an adapter could allow for more light..
B) You will actually lose a few stops by using a 35mm adapter. Try dialing down the contrast and sharpness on your 7D and practice shooting+editing with the footage. I'm sure you'll get the hang of it soon enough :) As you probably noticed, the LCD is more of a guide rather than a true representation when it comes to properly exposing your scene. Thank you Nicholas, for sharing this interesting test. I've tried the 7D video mode at dawn but I've found that above 1250ISO it becomes too much noisy in mid tone and dark areas, don't you think so? Yes Ronan, this is my experience too. That's what perplexes me about these SLRs at the moment. One thing they are praised for is their lowlight capabilities, yet I find that anything exceeding ISO1250 has a lot of noise, particularly chroma noise. Ronan, it's definitely noisy at ISO 1600 but it does look better than the noise I get at 12dB. As a guide I try to never shoot above 6dB. These days I try to light the area properly instead of shooting in the dark. This was the first time I handled the 7D so I'm sure much can still be learned. I would like to test it against the EX1 some time. 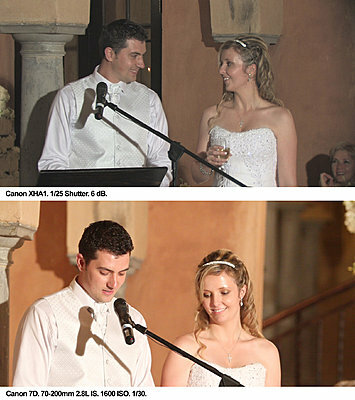 I used one 800W tungsten light about 12 meters away to provide light for reception. It was also very hard for me to get critical focus using the LCD. 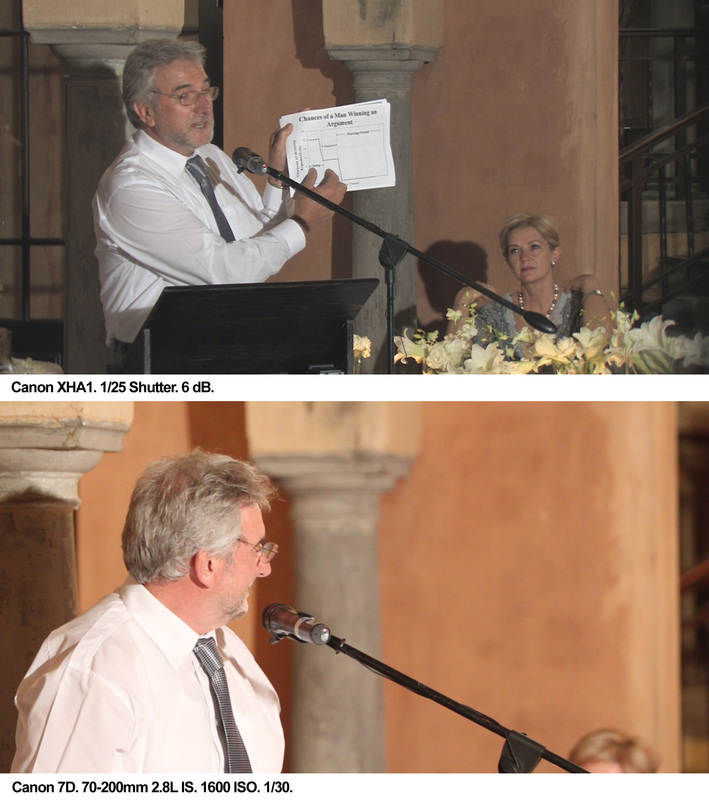 I also tried the 7D with a 50mm f1.4 lens @ 1000 ISO, 1/50, and the result are interesting : I had average on the screen the same level of light as it was on the stage. Unfortunatly there is no zoom opening at f1.4! The EX1 is much more sensitive than the XHA1 I think. I though that Dslrs in general should have a wider dynamic range....not less. 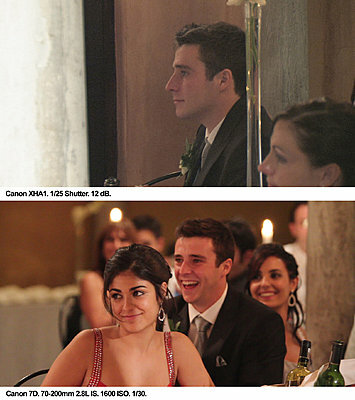 I am seeing similar issues with my 7d in situations where the lighting "is" low contrast to start with. And I have already set my contrast as low as it will go. Have to admit it does pull a great image out of not so well lit situations but often times it appears that it has a built in S curve that blows out the whites and crushes the blacks all too easily if you are not careful. Where can I find that super low contrast preset? The lowest I know of is to choose "Faithful" and then reduce contrast to the minimum. I prefer "Natural" with contrast reduced. If you start with "Standard", the contrast will be fairly high. Ok. So maybe I just had a realization....maybe I didn't. Each of the "presets" such as faithful", "natural" are unique in reference to the slider adjustments? What I mean is if I pick a preset, look at the settings it will all be "zeroed" out and any changes plus/minus will adjust from there? So the scale of adjustments are shifted according to the preset? I am asking because I just always thought that the presets were just pre-configured versions of the sliders. I'll have to look into this as it may answer why I can't seem to lower the contrast enough. ehh.. ok.. i'd like to know this too! I also agree that the 7D is blowing out detail in the whites. At least the XH-A1 camcorder is maintaining a lot more detail in the flowers, shirts and face cheeks etc. The XH-A1 could also be adjusted in presets to deliver more punchy high contrast shots straight from the cam if that is what is required.